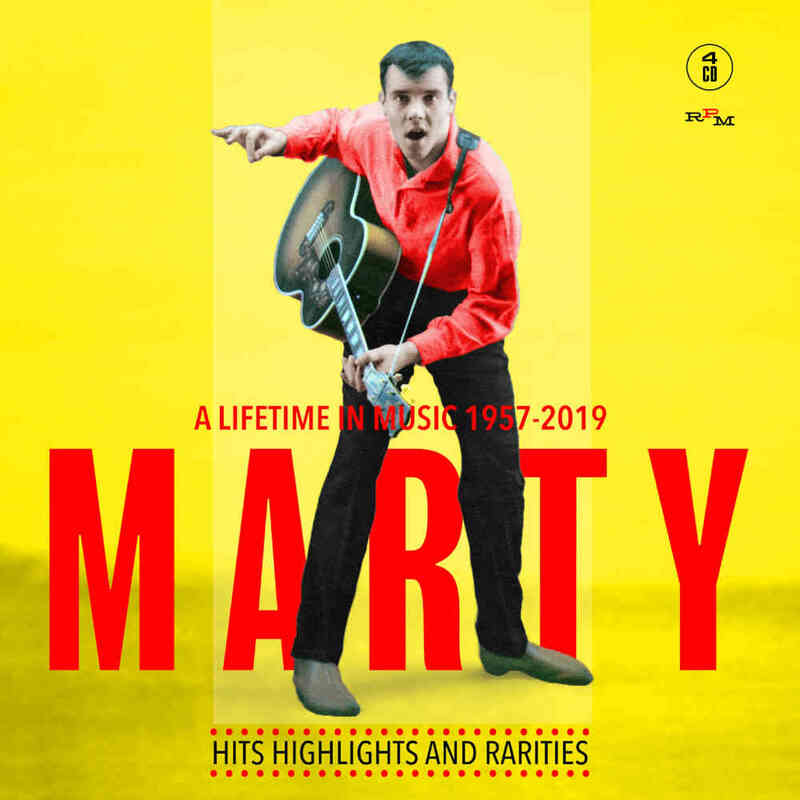 • One of the first generation of British rock’n’roll stars, Marty Wilde celebrates his 80th birthday (April 15th) with a UK tour and this very personal quartet of discs from across a musical career which spans over six decades. • During the late 1950s, Marty was one of the biggest UK pop stars, with a string of Top 10 hits for Philips Records, on which he was often backed by The Wildcats: ‘Endless Sleep’ (No. 4), ‘Donna’ (No. 3), ‘A Teenager In Love’ (No. 2), ‘Sea Of Love’ (No. 3) and ‘Bad Boy’ (No. 7). • As the Sixties dawned, Marty continued to enjoy chart success while evolving his sound away from American rock’n’roll: ‘Johnny Rocco’ (No. 30), ‘The Fight’ (No. 47), ‘Little Girl’ (No. 16), ‘Rubber Ball’ (No. 9), ‘Hide And Seek’ (No. 47), ‘Tomorrow’s Clown’ (No. 33), ‘Jezebel’ (No. 19) and ‘Ever Since You Said Goodbye’. In the mid-60s, he also recorded as folk-pop trio The Wilde Three with wife Joyce (ex-Vernons Girls) and future Moody Blue star Justin Hayward. • During the late 1960s, Marty became a hit songwriter for other artists, penning originals for The Casuals (‘Jesamine’), Status Quo (‘Ice In The Sun’) and Lulu (‘I’m A Tiger’). While his own career continued apace throughout the 1970s, Marty was also heavily involved with the launch of daughter Kim’s career in the early 1980s. In recent years, Marty has fronted one of Britain’s most respected rock’n’roll bands. • ‘MARTY’ is a unique celebration of Marty’s long and illustrious career. While Discs One and Two are devoted to all of his early A’s and B’s (including the aforementioned hits), Disc Three unveils a hitherto unissued Radio Luxembourg performance from 1959 while Disc Four boasts a whole CD’s worth of previously unheard demo recordings handpicked from Marty’s own archive. • Beautifully presented with remastered sound, detailed sleeve-notes and a booklet awash with images from across the years, MARTY perfectly commemorates the musical legacy of one of Britain’s most enduring talents who was awarded an MBE for his achievements.